NETHERLANDS: The North Sea Power Hub announced a new member, and transmission system operator (TSO) Tennet presented solutions for increasing the scale of wind farms off the coast of the Netherlands at WindEurope's conference in Amsterdam. The Port of Rotterdam joins Tennet Netherlands, Tennet Germany, gas infrastructure company Gasunie and Danish TSO Energinet in exploring the possible development of a wind power hub in the North Sea. Plans for the creation of a hub capable of supporting offshore wind farms with a total capacity of 100GW between 2030 and 2050 were first unveiled in June 2016. But any potential hub may need to support an even greater capacity. Climate consultants Ecofys last week published research stating the need for 230GW of offshore wind in northern Europe by 2045 – 180GW of which would be in the North Sea – and between 50GW and 80GW of new interconnectivity, if Europe was to meet the requirements of the Paris Agreement. Tennet CEO Mel Kroon described the need to support this capacity as "substantial, quite a challenge", at a plenary session in Amsterdam. Christopher Jones, the deputy director general for energy at the European Commission, said the required capacity needed new approaches from the industry. "If we are going to meet our targets in terms of climate change and renewable energy, we have created a great base to move forwards, but it is nothing more than that," he said. "The approach we have taken until today is just not going to fly." One suggestion Tennet made was to transport electricity generated at offshore wind farms to a transformer platform, and from there, via 220kV alternating current (AC) cables buried in the seabed to an onshore high-voltage substation. Five 700MW substations are currently being built in the Netherlands: two for the Borssele cluster, two for the Hollandse Kust (zuid) projects, and one for the Hollandse Kust (nord) site. Electricity is then carried to end-users via the national grid. But to realise wind farms with larger capacities projects will need to be further offshore, Kroon pointed out. He suggested that direct current (DC) cables might have to be used for these projects to operate in a cost-efficient way. This could be achieved by building converter platforms in the North Sea, Tennet suggested, or by building artificial islands. The latter option would allow DC converters to be placed on solid ground, Tennet stated. Kroon suggested that savings reaped due to utility of scale could be spent on such artificial islands. 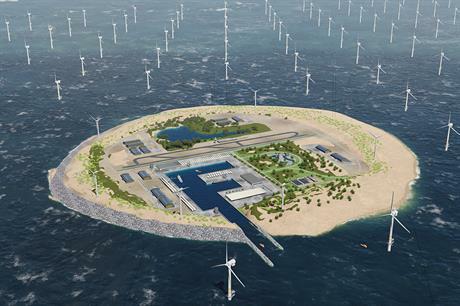 On these islands, he also proposed, hydrogen conversion facilities could be built, from where hydrogen could be stored and more easily transported back to mainland Europe. Kroon also suggested that it might be "helpful" for developers to be able to use the islands as a "port". Kroon and Jones were speaking at a plenary session of the North Seas Energy Forum – a group of developers, governments and TSOs from 10 countries on the shorelines of the North Sea – at the WindEurope conference in Amsterdam.